Dan DeQuille, William Wright, worked for the Territorial Enterprise during the great rush and development of the Comstock Lode. 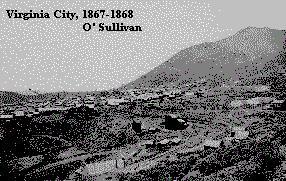 A hardened and knowledgeable reporter, DeQuille wrote many stories about the mines and activities of Virginia City, Nevada during late 1850s and continuing into the 1870s. He was considered a mining expert by many people, especially the miners themselves, and was invited into all the great mines. The wealth of his information about these great mines was published in the Enterprise's daily paper. Valuable Donkeys - Washoe "Canary"
During the great rush for the wealth of the Comstock, Virginia City's daily news paper, the Territorial Enterprise, had to hire another writer to keep up with the demand for news. A hungry, scraggly, dusty, "coyote-hole" miner showed up at the door to answer the need. Having only written to the newspaper a few times, and having never been seen before, he appeared as described above to begin his employment. The newly-hired reporter was destined to become DeQuille's life-long friend. We know him today as Mark Twain, the American humorist. Twain fine-tuned his writing skills during this period and had many opportunities to express his unique style of humor. We made these stories available to our electronic readers as part of our contribution to the information available on the Internet. Over the years we've found that many people enjoy Dan DeQuille's stories from Virginia City's historic past. In fact, the current day editor of the Territorial Enterprise found us on the web because of our stories. We built his web site originally and many of the pages we built are still on his site. In today's Virginia City the Mackay Mansion still stands and tours are given daily. There are many fun things to do there if you ever have time to hang out in the hinterlands of Reno and Carson City, wind up the road to Virginia City. You're sure to learn more about Dan DeQuille's more famous friend who also worked at the TE at the same time: Mark Twain. Samuel L. Clemens went from the pen name of Josh to the pen name of Mark Twain while at the Enterprise. It's curious to think that the phrase "I was just Joshing you..." originated from this pen name. After all, Clemens was fond of making humor from every day life. Send your question or comment to the editor of the Historical Gazette.